Google’s latest Nexus smartphones have finally arrived in India. The Google Nexus 5X will go on sale across online/offline channels at a price of Rs 31,990 for the 16GB variant and Rs 35,990 for 16/32GB. On the other hand, the Huawei-made Nexus 6P is priced at Rs 39,999 for the 32GB variant and Rs 42,999 for the 64GB variant. For those who pre-book the Nexus 6P today on Flipkart will get a free Chromecast along with the device. The company announced that both the Nexus 5X and Nexus 6P devices will be available for pre-orders starting today at 2PM and will go on sale from October 21. The devices will be available via two e-commerce portals – Amazon and Flipkart. The LG-made Nexus 5X will be sold exclusively via Amazon India while the Huawei-made Nexus 6P will be sold on Flipkart. 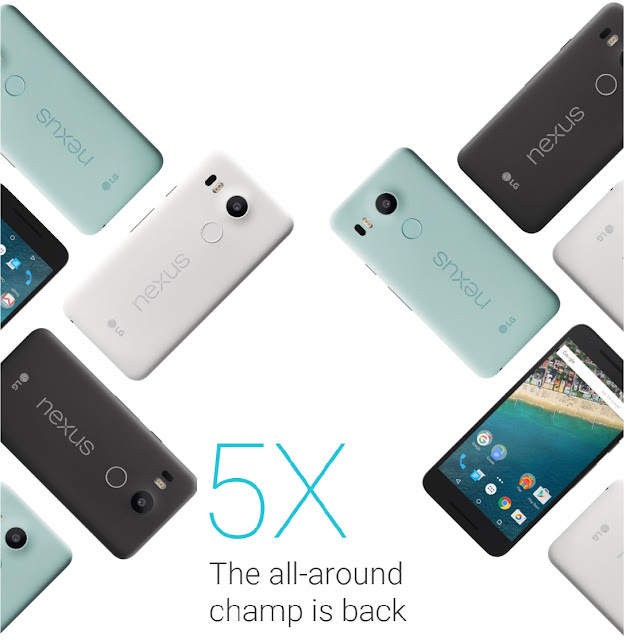 This is the first time that Google has released two Nexus devices. While the Huawei made Nexus 6P will sport a 5.7-inch QuadHD AMOLED display (with a 518ppi pixel density) with Corning Gorilla Glass 4 protection, the LG made Nexus 5X will come with a 5.2-inch full HD display (with a 423pi pixel density) with Corning Gorilla Glass 3 protection. Both phones will come with the Nexus Imprint fingerprint sensor which is located on the rear side of the phone. According to Google, this sensor helps you unlock your phone, use it to purchase apps on the Play Store and the fingerprint recognition happens under 600ms. The Nexus 6P will come with Qualcomm Snapdragon 810 chipset which has a 64-bit 2.0GHz octa-core processor with Adreno 430GPU along with 3GB of RAM whereas the Nexus 5X will sport the Qualcomm Snapdragon 808 chipset which has a 64-bit 1.8GHz hexa-core processor with Adreno 418 GPU. While the Nexus 6P will come in 32GB, 64GB and 128GB storage variants; the Nexus 5X will have 16GB and 32GB storage variants. Neither of the Nexus handsets will come with expandable storage options. On the camera front, Google has added on a 1.55micro pixel size sporting 12.3MP rear camera on both phones, but with the Nexus 6P you get an 8MP front facing camera and with the Nexus 5X you get a 5MP front-facing camera. Both phones are capable of shooting 4K videos and will also feature 120FPS slow-motion video feature, with the Nexus 6P also supporting a 240FPS slow motion video feature. Both phones will support a 30FPS Smart Burst feature which will let you make GIF animations. The Nexus 6P comes in an all-metal body design and measures only 7.33mm thick. It will sport a 3,450mAh battery. The Nexus 5X on the other hand will come with a 2,700mAh battery. Both the phones will come with the USB Type-C connector which will support fast charging technology. According to Google, Nexus 6P will give you 7 hours of use with 10 mins of charging and Nexus 5X will give you 3.8 hours of use with 10mins of charging.